CALDER PARK, Victoria -- Round 6 of the Summit Racing Equipment Sportsman Series is coming to Calder Park Sunday December 27 with some Group One heavy hitters set to test their wares on the newly upgraded drag strip. Reigning Australian Pro Stock Champion Lee Bektash will test his Mopar while Top Alcohol Funny Car racer Robert Ambruosi will compete in Group Three Supercharged Outlaws. 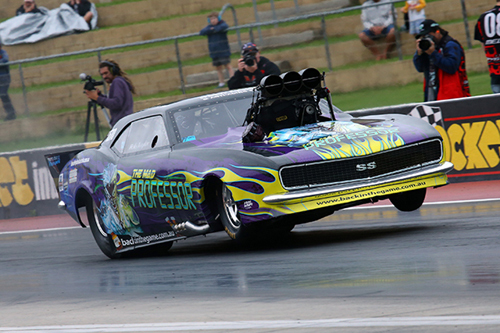 Top Doorslammer's Robin Taylor (Moonee Ponds) will also make his presence felt in his beautifully turned out SS Camaro targeting a five second pass in his preparations for the Australian Nationals, back at Calder Park for the first time in 15 years, next month. "Anthony Rodrigues has come on board with us as a full time tuner," said Taylor. "The car ran six-seconds in Sydney, we short shifted every gear in Sydney on that pass so we're really looking to run a five-second pass at Calder (on December 27). "It's our home track; we don't get to race there very often. We're extremely excited about the fact it's up and running and resurfaced." Taylor came away impressed with the upgraded surface on his one and only test pass in November and is excited by what is in store when the Summit Racing Equipment Sportsman Series visits for a one day Christmas cracker as part of the Rowe Memorial on Sunday December 27. "The surface is unbelievable," he said. "We went five seconds to 1000 feet with an early shut off and we only had one run due to a malfunction of the supercharger pulley - we didn't have a spare. "But the track was unbelievable. It's really flat and even now. There's no big transition point, it's really nice. "I think we're going to see some good racing, there's a lot of entries and it should be a good event." Taylor plans to use the event as somewhat of a test session with an eye on the Australian Nationals to be held at Calder Park for the first time since 2001 on January 23-24, 2016. "For us we're going to put in a real cracker, I've told the boys to turn the car up as long as the track is there which I'm sure it will. Peter (Pisalidis) does an excellent job on the preparation so we hopefully will run that five second pass. "We're going to get some testing in before the Nationals regardless but (the Rowe Memorial) will definitely be a bit of testing for us. We've got a few things we're going to implement in the car, we've got a fuel system and then we're going to do some private testing before the Nationals so when we come out to that event we should be running right on the pace." Round 6 of the Summit Racing Equipment Sportsman Series will be held as part of the Rowe Memorial Super Stock Classic at Calder Park on Sunday December 27. Qualifying begins from 9am. For more information please click here.